Whether it was the Native American Indian tribes, pioneers, railroad laborers or meat packers, everyone who came to call Omaha home helped shape its current cultural diversity, hard work ethic, and friendly demeanor. Named after an American Indian Tribe, Omaha means "Those going against the wind or current", Omahans proudly continue to live up to the name. 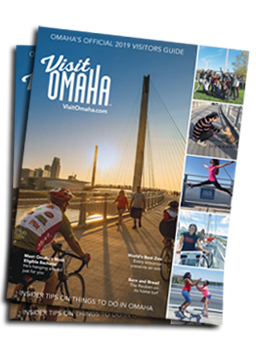 In recent years, the Omaha riverfront and downtown area have experienced tremendous growth with over two billion dollars in new development. A one-of-a-kind $22 million pedestrian bridge S-curves its way across the Missouri River, the signature, cable-stayed Bob Kerrey Bridge is one of the longest pedestrian bridge projects ever constructed, giving Omaha visitors a breathtaking view of the ever-changing skyline. CHI Health Center Omaha, the city&apos;s convention center, and arena attracts big-name talent while providing a spacious technology-rich venue for conventions. The 346,000 sq. ft. facility is complemented by the two-million-dollar public art project, "Illumina". The colorful display features more than 40 sculptures inspired by the 13th Century Carnival of Venice and was created by artist Matthew Placzek. It&apos;s just a small sample of the creative public art that sprinkles the city. Currently, the 42nd largest city in the United States, the metropolitan area is home to over 900,000 people who welcome visitors with open arms and authentic Midwestern hospitality.